We’d love your help. 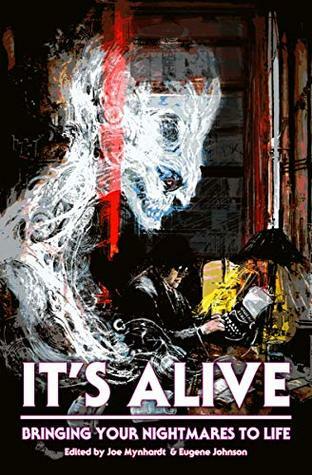 Let us know what’s wrong with this preview of It's Alive by F. Paul Wilson. Book two in Crystal Lake Publishing’s The Dream Weaver series picks up where the Bram Stoker Award-nominated Where Nightmares Come From: The Art Of Storytelling In The Horror Genre left off. It’s Alive: Bringing your Nightmares to Life focuses on learning the craft in order to take your story from concept to completion. With an introduction by Richard Chizmar and cover art by Luke Spooner. Featuring interior artwork from horror master Clive Barker! To ask other readers questions about It's Alive, please sign up. So, you say you want to be a writer. You have a great idea for a story – something that nobody will ever see coming. Pulitzer Prize for literature is eminent. You only have one problem; where to start. You head to your local bookstore (or library) to find “a” book on writing, only to find a plethora of titles. Some that revolve around inspiration, some that cover the technical aspects, and a few that offer some “insider” tips on getting your book out there. But there aren’t many that cover every So, you say you want to be a writer. You have a great idea for a story – something that nobody will ever see coming. Pulitzer Prize for literature is eminent. You only have one problem; where to start. You head to your local bookstore (or library) to find “a” book on writing, only to find a plethora of titles. Some that revolve around inspiration, some that cover the technical aspects, and a few that offer some “insider” tips on getting your book out there. But there aren’t many that cover every aspect of the trade, from A to Z; and I don’t believe there are any that contain a compilation of advice by a multitude of talented authors who have been through the ringer, and come out on top. That was until Joe Mynhardt and Eugene Johnson of Crystal Lake Publishing decided to come up with their Dream Weaver series. Last year they had a hit with “Where Nightmares Come From” (read my review on that one – better yet, just skip my review and read the book), and this year they hit it out of the park again with “It’s Alive: Bringing Your Nightmares to Life”. 1)	Writing, Storytelling, and Horror, oh My – Here, experts like Gene O’Neil, Joe R. Lansdale, Todd Keisling, and Chuck Palahniuk take the time to give you a little insight on why and how an author writes, with an emphasis (obviously) on horror. 2)	Learning some of the basics – How should I begin? This is what Richard Thomas, Tim Wagonner, and others cover. From outlines to techniques, you are afforded an indispensable toolbox (apologies Tim for stealing your verbiage) as to getting started. 3)	Characterization – Let’s face it, two-dimensional characters will kill a story faster than George R. R. Martin kills characters. Who better to learn the ins-and-outs of character building from than F. Paul Wilson, Kealan Patrick Burke, Mercedes Yardley, Lisa Mannetti, and others? 4)	Structure of the Plot – So, you’ve started your tale and built phenomenal characters, no what? Well, plot is a good idea, or else the characters will just stand around doing nothing. Tim Chizmar has an interview with the incomparable Clive Barker that is an experience in and of itself. 5)	Writing Your World – As an old D&D Dungeon Master, I can tell you that building a world from the ground up is difficult, and you will get called out on inconsistencies. Join Mick Garris, Heather Graham, and others in a round-table discussion moderated by Del Howison. 6)	The Nitty Gritty – In my humble opinion, this is one of the most important sections to this tome. You’ve finished your Great American Novel – but have you? The next step is what most authors hate, and that’s editing. Tom Monteleone, and Jessica Marie Baumgartner take you by the hand and tell it like it is. But you also have Bev Vincent explaining the benefit to research, Greg Chapman giving an eloquent background to his novel “Hollow House”, and great advice from Lisa Morton on how to write for a “themed-anthology”. 7)	Now What – Last but not least are two pieces of fantastic advice from James Chambers, and Jess Landry about contracts and the submission process (side note, if you don’t laugh while reading Jess’ piece, you have absolutely NO sense of humor and need to stop following me since we can never be friends). As a reader, writer, and reviewer, I constantly seek out whatever will improve my crafts. Crystal Lake Publishing offers some of the best collections on writing that I am aware of (and yes, reviewing is writing too!) In their newest offering, IT'S ALIVE: BRINGING YOUR NIGHTMARES TO LIFE, accomplished authors tell all you need to know about improving your craft and getting your story "out there" to readers. These are multiply-published authors who have been there and done it all, and they know whence they're coming from. IT'S ALIVE is the sequel to the equally outstanding WHERE THE NIGHTMARES COME FROM, and both volumes are an essential addition to any writer's library of reference and knowledge. Crystal Lake Publishing has released a number of guides designed to help horror writers, including the Writers on Writing series, which spans multiple useful volumes. This tome features an impressive array of such horror storytellers as Jonathan Maberry, John Skipp, Joe R. Lansdale, Tim Waggoner, Brian Kirk, Kealan Patrick Burke, Christopher Golden, Lisa Morton, and so many more. As Richard Chizmar, publisher of Cemetery Dance Magazine, asserts in his introduction, it used to be that before the Internet, the only way to get writing advice of good calibre from professionals was by attending conventions. Of course, this is still a very good idea and a great way to absorb a lot of information in a more memorable way, but as Chizmar is quick to point out, conventions cost time and money, and not everyone can afford to go or they must be very selective and plan ahead for a long time before they’re able to go. Crystal Lake’s latest writing guide is choc-full of many useful essays and information collected in one indispensable book for the reader’s convenience and focuses on horror specifically, which is rare to find. “Confessions of a Professional Daydreamer” by Jonathan Maberry emphasizes the importance of craft, which takes years to learn, and that while natural storytelling ability is part of the equation, it’s smaller than you may think. Of course, it didn’t hurt that he met Ray Bradbury and Richard Matheson as an impressionable youth 😉 He recommends the “What if” exercise as a way of generating ideas but also running with them and making them stronger. “What is Writing & Why Write Horror?” by John Skipp focuses on deconstructing the responses most people give to the answers to both questions that form the title of his piece, and they vary. “Tribal Lays” by Gene O’Neill discusses his history and process of getting to where he is today, which is meant to serve as a reminder that a smooth path to publication without any bumps along the way is not quite practical, so he offers some thoughts on the matter. “Bake that Cake (One Writer’s Method)” by Joe R. Lansdale sees the horror legend using the metaphors of baking to discuss how he approaches a story, what works for him, and then passes the baton to his daughter, Kasey, who talks about her process and what works for her. “They Grow in Shadows: Exploring the Roots of a Horror Story” by Todd Keisling discusses his creative process, how he comes up with the horror that he writes, his process of tapping into his own fears, the ‘what if’ method, writing regularly, and more. In “Zombies, Ghosts and Vampires—Oh My!” Kelli Owen talks about probably the three most common tropes of supernatural character types used in horror fiction, archetypes, clichés, more character types (such as werewolves) and about some tips and tricks to make them stand out in your own fiction. “The Many Faces of Horror: Craft Techniques” by Richard Thomas breaks down the basics like Showing vs. Telling, description, passive vs. active voice, and much more. “Giving Meaning to the Macabre” by Rachel Autumn Deering analyzes all the elements that go into a plot like the ‘Inciting Incident’ up to the ‘Resolution,’ while “The Horror Writer’s Ultimate Toolbox” by Tim Waggoner goes into the most commonly-asked question he still regularly gets, which is what advice he would give to beginning horror writers. In this essay, he offers a summation of the things he usually says. He breaks down core emotions and feelings such as dread, terror, and more to illuminate his engaging advice. Next up, Marie O’Regan interviews horror legend Sarah Pinborough before the book breaks into the ‘characterization’ section, starting off with “Conveying Character” by F. Paul Wilson. The Repairman Jack author stresses the importance of fostering a connection between your character and the reader. They have to care what happens to that person. He counsels that going with your gut is a good idea because too much analysis and over-analysis can spell a not-so-great character. As he asserts, “…plot happens to people.” He goes on to describe his own approach and what works for him, which contains some useful nuggets of wisdom indeed. Next up is Brian Kirk weighing on with his interestingly-titled piece, “Sympathetic Characters Taste Better: Empathy in Horror Fiction.” With a quote from Stephen King to start things off, master of characterization and emotional gut-punch horror Brian Kirk extolls the importance of how to make characters stick in the reader’s mind. He provides excellent steps on what approaches to take in order to craft compelling characters that the reader will grow to care about and want to know what happens to. He breaks down motivations behind why people do things as well as a note to remember that everyone reacts to things differently. One person might do X but the other may do Y. Given that Brian is one of the absolute best in the horror genre with, as I mentioned, an absolute mastery of characterization in his pieces, his contribution to this volume is a stand-out and readers should pay particularly close attention to it. Following that up, we have “Virtue & Villainy: The Importance of Character” by Kealan Patrick Burke, another master of characterization and one of the best in the horror genre. He breaks down a very interesting reaction to some characters in his novel, Kin, and uses it as an effective frame of reference to break down how to accomplish empathy for characters that decidedly more villainous on the spectrum. We then move on to Dialogue with Elizabeth Massie‘s piece, “Don’t Look Now, There’s a Head in That Box!” She Ejaculated Loudly (Creating Effective Dialogue in Horror Fiction),” pointing out that there are two kinds of dialogue for a start: internal and external, and breaking down the differences and purposes for both. She discusses just how dialogue advances the story and shows how characters relate to others. She provides some amusing examples of bad dialogue and explains why it’s so bad. As well, she advises authors on how to make the most of dialogue and use it to its full potential. Next up, Lisa Mannetti presents “Point of view: Off On with their Heads! in which she breaks down how to decide what point of view (or points of view) to go with, common pitfalls to avoid, and a discussion of first person vs. second person vs. third person as well as the considerations involved with using them. She also talks about unreliable narrators, which was a useful addition. She provides an analysis of the works of fiction and films that most of us will be familiar with to illustrate her points, which worked effectively. The following section deals with plot and structure, and the piece that kicks this off is an interview with Stephen Graham Jones, a detailed and fascinating piece by Vince A. Liaguno. Other pieces in this section include “Building Suspense” by David Wellington, “Conveying Horror” by living legend Ramsey Campbell, “Unveiling Theme Through Plot: An Analysis of Nathaniel Hawthorne’s ‘The Birthmark’” by Stephanie M. Wytovich, and a fascinating interview with master of horror Clive Barker by Tim Chizmar from Halloween 2018 in California. Next, we have a section called ‘The Nitty Gritty,’ which might be synonymous with getting down to brass tax. Starting things off here is Bev Vincent, the famed Stephen King biographer, who discusses research, followed by “Editing Through Fear: Cutting and Stitching Stories” by Jessica Marie Baumgartner, and following this, Aussie horror author and brilliantly-talented graphic designer Greg Chapman talks about “Leaping into the Abyss,” which, appropriately, discusses the task of how to approach writing a novel. Tom Monteleone follows next talking about editing anthologies, and as the editor of the award-winning Borderlands series, he knows a thing or two about it. Next up, Lisa Morton, president of the Horror Writers Association and brilliant writer, talks about writing for themed anthologies. Following this, John Palisano, Vice President of the HWA and another brilliant writer (all of the writers in this book are fantastic, btw), offers up a Roundtable Interview with David J. Schow, Linda A. Addison, Tonya Hurley, Cody Goodfellow and Mary Sangiovanni to talk about the place of the written word in the world, answering a bevy of fascinating questions. Overall, Crystal Lake Publishing has assembled an incredibly impressive array of helpful writing advice and guidance from a wide variety of some of the best and brightest writers in the horror genre, and it’s well worth shelling out the cover price for this tome, which should be on the bookshelf of every horror writer, taking its rightful place beside Stephen King’s On Writing and the Horror Writer Association’s staple, On Writing Horror. As a member of the Horror Writers Association, I received this as a complimentary copy to be considered for awards. This is an astounding, invaluable collection of essays and interviews about all aspects of writing horror, from the short story to the feature-length film. I was highlighting something on every single page, and often several things per page. I highly recommend this book for anyone who writes horror or is interested in giving it a shot. What If? That's how this collection of essays opens. What if some of the best authors in the business decide to pass on their expertise to those following in their path? Answer: You get this book, an invaluable selection of hints, tips and sometimes, demands on everything from character creation to plotting to submission. For me, as well as the writing tips, I enjoyed the sections dealing with creating and editing anthologies and also how NOT to speak to an editor. Advice is given and yes, some c What If? That's how this collection of essays opens. What if some of the best authors in the business decide to pass on their expertise to those following in their path? Answer: You get this book, an invaluable selection of hints, tips and sometimes, demands on everything from character creation to plotting to submission. For me, as well as the writing tips, I enjoyed the sections dealing with creating and editing anthologies and also how NOT to speak to an editor. Advice is given and yes, some conflicts as writers have different methods, eg plot v character, one or two drafts or multiple. It's up to you to take what you want from this - or not, although there is one golden rule that ALL promote - show not tell. With each essay, it was as if the author(s) were sat in the room with you, chatting about their craft as to an equal. All remember where they came from in writing terms, there is no superiority, no patronising or condescension. They are us and hopefully those who read this will one day become them. With a total of 36 articles from genuine horror legends such as Clive Barker, Joe R. Lansdale, F. Paul Wilson, Mercedes Yardley and Ramsey Campbell, plus additional best-sellers such as Kevin J Anderson, this collection is absolutely packed with sage advice, witty commentary and plenty of motivation. If this doesn't get you up and writing better than you've ever done, nothing will. Whilst there are plenty of books on writing great stories, this one puts horror front and centre. It is definitely n With a total of 36 articles from genuine horror legends such as Clive Barker, Joe R. Lansdale, F. Paul Wilson, Mercedes Yardley and Ramsey Campbell, plus additional best-sellers such as Kevin J Anderson, this collection is absolutely packed with sage advice, witty commentary and plenty of motivation. If this doesn't get you up and writing better than you've ever done, nothing will. Whilst there are plenty of books on writing great stories, this one puts horror front and centre. It is definitely not simply a book about writing. Almost every article is centred around horror, and even those that aren't specifically about the genre, such as Anderson's piece on world building, are very useful to the horror writer. There are several formats of article, from straight essays to interviews to round-table discussions. This variety helps to keep things interesting and keeps you turning the pages as you try to absorb all the knowledge being presented. I haven't yet read the first book in the series, Where Nightmares Come From, but after reading this volume I'll be doing that very shortly. There's a lot to be said for books about writing. And this is one of the books that does it right. The collection of essays, articles, and interviews give a variety of approaches to different aspects of genre writing. While it does leave you wanting more, what is there is amazing and very helpful.